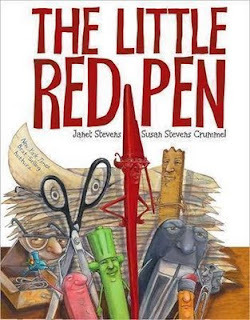 In the book a red pen takes on the task of completing a huge task alone but in the end only bad comes from the situation. There are many characters in this book. There is a pen, a stapler, a highlighter, a ruler, a yardstick, an eraser, and other basic office supplies. This is a helpful book because it shows the value of teamwork. It also shows that not one person can do a job that requires many. This is a good book to read to children because it shows the different dialog by using different colors and font type for each different character. This can allow the reader to use different voices to entertain the children or audience that they are reading to. The illustrations are good in the book also. They have a lot of color and even though the characters are inanimate objects you can still see the facial expressions. Note from Alysa: I haven't read this one yet, but I'm guessing it plays on the story of The Little Red Hen. Sometimes I identify pretty well with that bossy chick, so I'll have to pick this one up!